[ o _ o ] A h ! P u c h ! Once a year the sleepy Atlantic port town of Essaouria in Morocco is flooded with nearly half a million tourists, most of them Moroccan. 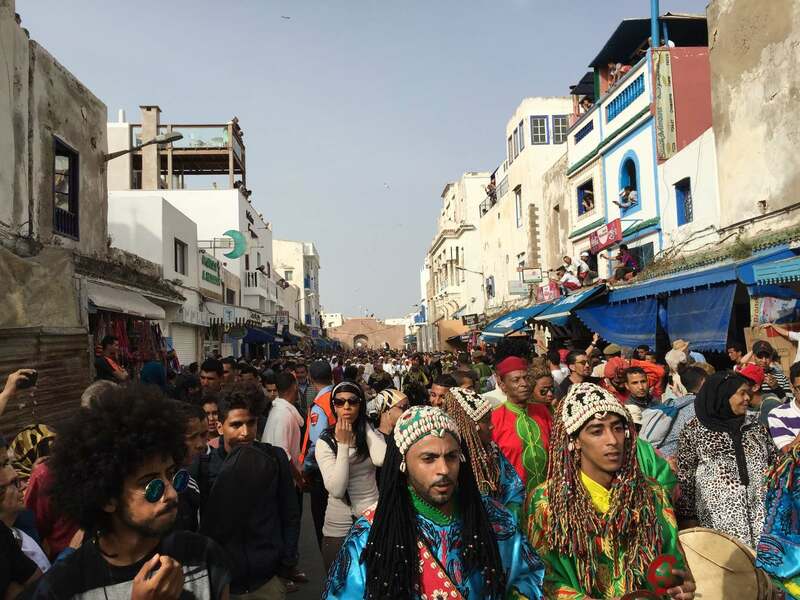 They come for the Gnawa Festival, four days where Gnawa music and culture takes center stage. Dressed in colourful robes and caps studded with cowry shells, the medina resonates like a giant calabash with the sound of krakebs (metal castanets), tbel (drums), gimbri (a three stringed bass instrument), handclaps and the voices of the Gnawa themselves. Away from the lights and massive sound systems of the main stages, where the likes of Pharoah Sanders, Wayne Shorter and The Wailers have performed fusion music, lays a different story. 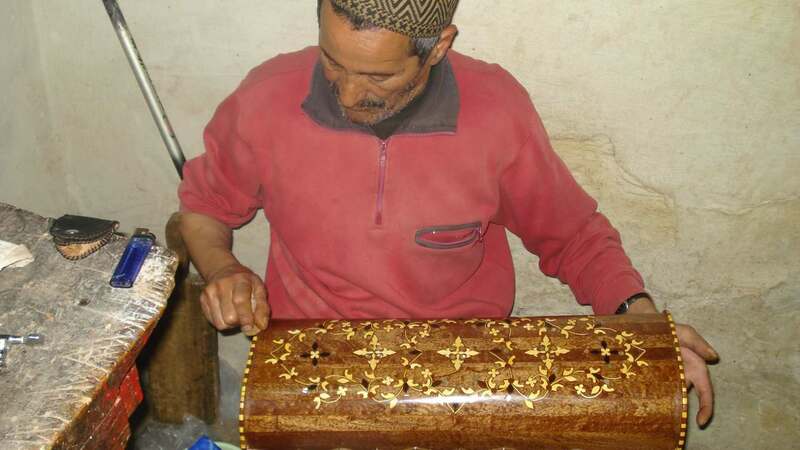 Hidden amongst the labyrinth of the medina, is a small, windowless workshop that has been unofficially dubbed ‘The University of Gnawa’, where these recordings were made. Knocking on its medieval door, you hear Maâlem Seddik call out ‘Entrez’. Inside you step over woodcarvings from the gimbris he is building. He doesn’t speak much English, and I speak even less French, so communication is limited. He plays host to an endless flow of musicians who come and sit, night and day, in the dark workshop, telling stories, playing gimbri, singing songs, eating, drinking and smoking. Seddik passes me an old cassette tape (see track 1), which acts as a substitute for krakebs, and we sit playing for hours with a group of local musicians. A trance descends upon the room, until finally it is time to take a break. ‘Are you heading out to the festival?’ I ask, and Maâlem rolls his eyes and speaks in French to a friend who translates in to broken English for me. The festival is four days of bright flashing lights and loud speakers that vanish as quickly as they appear. The festival has become one of show biz. For Maâlem Seddik and his friends, Gnawa music is a way of life that extends far beyond the limitations of a four day festival. The history of the Gnawa is a long and complicated one. If you believe Jimi Chaplin, a local Gnawa musician who takes his name from Jimi Hendrix and Charlie Chaplin, then the Gnawa are direct descendants of Bilal who cured the Prophet Mohammed’s daughter Fatima of an ailment by singing her a song. Dr. Chouki El Hamel cites three important meanings for the term Gnawa; ‘Firstly it refers to black people who were enslaved in West Africa. It is commonly believed that Gnawa of Morocco were originally black slaves…who over time became free under various historical circumstances. Secondly, it defines a religious and spiritual order of a traditionally black Muslim group. The Gnawa are a mystic order which marks its exclusiveness within Islam with the spiritual components of their practice incorporating references to their origin and enslavement. Finally, it denotes the style of music associated with this order. The ancestral memory (turath) of the displaced and enslaved is preserved mainly in their songs and dances’ (1). Central to Gnawa culture is the musical and ritualistic tradition of the lila, a rich ceremony of song, music, dance, costume and incense that takes place over the course of an entire night, ending around dawn. Gnawa, whose ancestors were neither literate nor native speakers of Arabic, begin the lila by recalling, through song and dance, their origins; the experiences of their slave ancestors, tales of abduction, sale, separation, loneliness and ultimately redemption. The ceremony recreates the first sacrifice and the genesis of the universe by the evocation of the seven main manifestations of divine creation. It calls the seven saints and supernatural entities (mluk, Arabic: ملوك) represented by seven colours. The mluk are abstract entities that gather a number of jinn (genie spirits). The participants enter a trance state (jedba) in which they perform spectacular dances. Through these dances, the participants negotiate their relationships with the mluk, either placating them if they have been offended or strengthening an existing relationship. The mluk are evoked by seven musical patterns, who set up the seven suites that form the repertoire of dance and music of the lila. During these seven suites, seven types of incense are burned and the dancers are covered by veils of seven colours. Later, the gimbri opens the treq (“path,” Arabic: طريق), the strictly encoded sequence of the ritual repertoire of music, dances, colours and incenses, that guides the ecstatic trip across the realms of the seven mluk, until the return to ‘the common world’, at the first light of dawn (2). The Gnawa Festival of Essaouira is on every year in May or June. 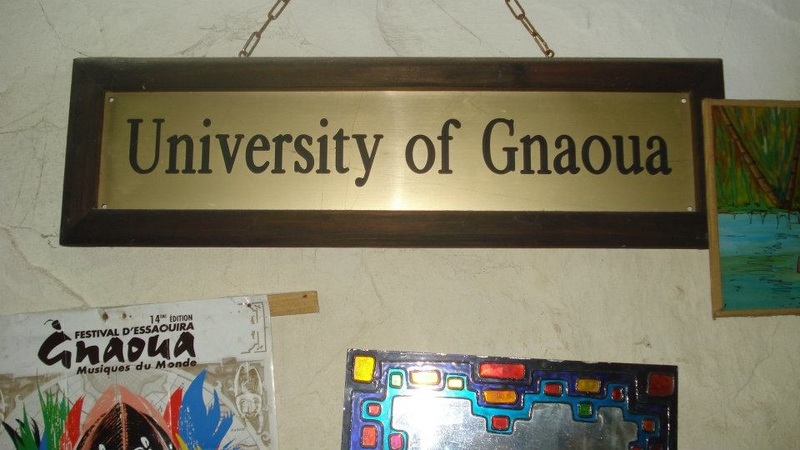 Maâlem Siddik and his University of Gnawa can be found all year round. With strikingly smoky vocals and musings of a world gone sideways, The Grand Magoozi is ready to take hold of The Toff In Town for the release of her debut self-titled album on 24 March. Recorded live in Melbourne over three days in classic indie muso fashion, the album saw the recruitment of Nick Huggins of Two Bright Lakes and a handful of talented musicians. It features the single The Last Cowboy — an idyllic track sung from the perspective of a city dweller yearning to live the simple, yet hard work lifestyle of the cowboy. The accompanying video features a rather adorable cowboy kid living out his days in a desolate country town. Prophets workshop for Artplay, as part of the 2014 Melbourne International Jazz Festival. Workshop consisted of mask-making, instrument-building, collective improvisation and spontaneous composition. Thanks to everyone involved! The kids, the parents, Artplay, City of Melbourne, The Melbourne International Jazz Festival and the rainy weather!